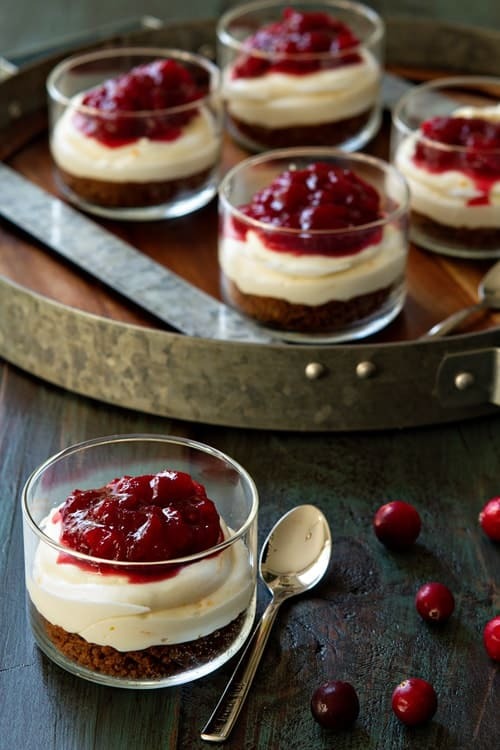 No Bake Cranberry Orange Cheesecakes are perfect for any holiday gathering. Bright flavors of the Fall and Winter seasons meld together into terrific bites of bliss. This is a sponsored post on behalf of Challenge Butter. All opinions are my own. Here I go again with the mini desserts. I just can’t help myself! There’s something just SO elegant about rows of petite serving cups, layered with a delicious, creamy dessert full of all the right flavors. These beauties just happen to be filled with the right flavors of cranberries and orange. Plus, they’re no-bake. Just whip them up, chill them in the fridge, and serve to the delight of everyone you know. I don’t know why I don’t do things with this flavor combination more often. Cranberries and citrus are a match made in flavor heaven. Cranberries are pretty tangy on their own, but not so sweet. Oranges are sweet, with their own version of tang. Together? Magical, I tell ya. Especially in cool, creamy no-bake cheesecake. This recipe is one that’ll get you through any potluck party, all season long, from November to January. 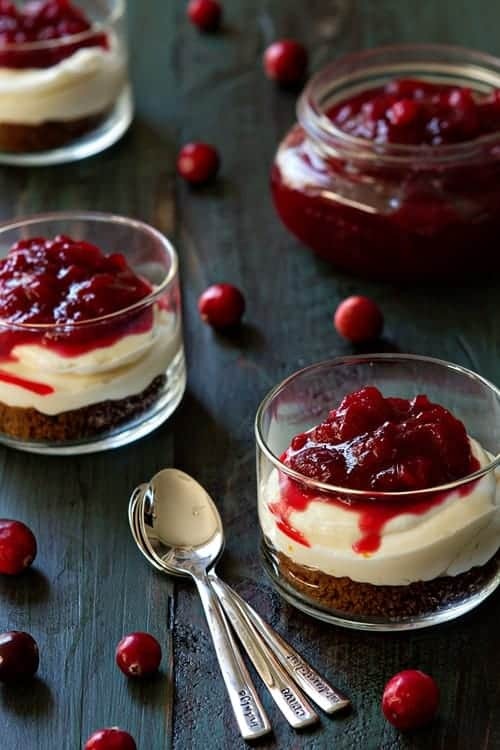 The mini cheesecakes are small enough to get away with being eaten in “don’t-ever-eat-again!” January, but every bite is creamy, and tastes absolutely decadent, making them at home on a Thanksgiving or Christmas dessert table too. The other day I shared homemade cranberry sauce, and you can use that here, or use store-bought that’s been joojed up with freshly squeezed orange juice and a little Grand Marnier. No matter what, don’t skip the good quality cream cheese! I use Challenge Cream Cheese whenever possible. I’m a Challenge Butter Ambassador, and I LOVE their products. I’m especially proud to be an ambassador because Challenge Butter and UNICEF have joined forces to address and build awareness of the childhood malnutrition crisis – which results in the unnecessary loss of nearly three million young lives a year – through a Pinterest campaign where for every recipe pinned, Challenge will donate a meal to UNICEF to feed a child in need. Together we can all fight malnutrition the world over, guys. And all it takes is a few pins. Beginning today through December 31, 2014, Challenge will donate a meal for a child in need to the UNICEF foundation for each recipe pinned from its “Pin a Recipe, Feed a Child” Pinterest board. Challenge has commited to provide up to 75,000 meals through this campaign. For more delicious pinnable recipes, please check out this Pumpkin Spice Caramel Sauce from Cookies & Cups and these Sugared Cranberry Shortbread from Confessions of a Cookbook Queen. So do me a favor – pin a few things from that board, and make these gorgeous No Bake Mini Cranberry Orange Cheesecakes for people you love this holiday season. It’s the little things that make every holiday special, right? 1. 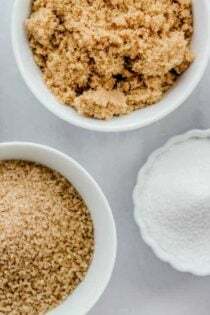 In a food processor or blender, combine the gingersnap cookies and pumpkin pie spice. Pulse the machine until the cookies form crumbs. In a small bowl, combine cookie crumbs and butter, mix until combined. Press crumbs onto the bottoms of individual serving dishes – about 2 heaping tablespoons per dish. 2. In the bowl of a stand mixer fitted with the paddle attachment, or in a large bowl with an electric mixer on medium speed, beat together cream cheese, confectioners’ sugar and orange zest for about 3 minutes. Add in vanilla extract and beat an additional minute. Pipe or spoon cheesecake filling into individual serving dishes, directly onto the prepared crust layers. – Cranberry Cheesecakes can be stored cover and in the refrigerator for up to 2 days. – Individual glass dishes were purchased from Pier 1. Spoons are from The Vintage Pearl. Disclosure: This post is sponsored by Challenge Butter; however, the views and opinions expressed on My Baking Addiction are my own, and based upon my experiences with Challenge Butter. Thank you for supporting Challenge Butter and the brands that continue to make My Baking Addiction possible. Fabulous flavor combo. I am in love with mini desserts too. Thanks so much for visiting, Stephanie! These. Look. Divine. I love no-bake cheesecake. It’s just so easy and goooood and makes me want to curl up in my pajamas with my favorite book(s) and all that creamy goodness. I can’t wait to make these. They are happening in my house this weekend, no ifs, ands, or buts about it. Thanks so much for stopping by, Michelle! I hope you enjoy the recipe. love these and the flavor profile, Perfect holiday dessert! Holy Smokes!! These look insanely delicious! I love that you put gingersnaps into the crust! YUM! not even kidding Jamie – these made my mouth water!! you’re right, citrus and cranberries are a match made in heaven and i love that these are no-bake AND individualized servings! These are SO cute and what a great Thanksgiving dessert they’d make! I most definitely agree, Courtney! Thanks for stopping by! LOVE mini desserts .. now I am off to PIN 50 things!!! Totally incredible! My family would love these for Thanksgiving! You’ve convinced me that I want to go on this edible date with cranberry and oranges. These are gorgeous and sound so so so addicting. Pinned! It’s definitely a super delicious date! Enjoy and thanks for stopping by! Cranberry and orange just go so well together. Love these cute little mini cheesecakes!!! I most definitely agree, Jocelyn! Thanks so much for visiting and taking the time to comment. I would love to convert this to one big cheesecake for Thanksgiving. Any tips on doing this? I think you could easily convert this using a traditional graham cracker crust or even a store bought crust. The filling should be enough to fill an 8 or 9 inch crust. I hope this helps. Definitely a great way to use up leftover cranberry sauce! I totally agree, Erin! Thanks for visiting! I live in the Northern Neck of Virginia and have no access to a decent grocery store. How can I order these products on line and have them delivered to my house or what is the nearest store to me? Or how do I find out? Since most of these ingredients are perishable, I don’t know if you could get them mail order without a big expense. I have no idea where you’d order them from. Perhaps a google search would help? well, these are just a perfect little after dinner treat! I adore individual desserts. Oh my, this looks good! I’m totally making this for the Thanksgiving pot luck I’m attending. I already was taking my home-made cranberry sauce so this recipe will ramp up that offering. I don’t make my own spice combinations, however. I use Penzey’s Spices and help to support another wonderful, family-owned, progressive and fabulous small business. Can you tell me the size of the glass dishes (I guess in oz)? Hello! I believe they are about 5 ounces each. I hope this helps. Very lovely recipe! I will try to replicate it without butter and cheese because my husband is allergic to diary products, but the photos and idea are amazing! Good job! Lovely recipe. I love mini anything. And these look out of this world! And you are so right mini desserts just look stunning on any table… beautiful! Thank you, Mhay! I hope you enjoyed them! Do you think I could successfully make these in mini cupcake papers? I would like to make a large batch of these to take to a Christmas party. Hi, Susan! I think mini cupcake papers would be fine. I hope you had a great holiday season! I made these last Thanksgiving, and will be making them again this year! They are SO GOOD! I repurposed those little glass jars that you have left over from the glade candles. Sterilized them and they were really cute. Wonderful, Suze! I’m so glad you like them enough to make them again! HEllo. i ve made this dessert over a hundred times and all my friends love it. That’s wonderful, Wajeeha! I’m so glad everyone likes it! Perfect for Mini mason jar treats! Thank you! You’re welcome, Karen! I hope you enjoy them! LOVE THESE! Have made this dessert two years in a row for Christmas. They are loved by all!! Thank you! You’re so welcome, Traci! I’m glad everyone likes them! Instead of using glasses, could I use the same recipe by using cupcake liners? Hi Briley – Cupcake liners by themselves won’t be sturdy enough to hold the cheesecakes. You’ll definitely want to use some kind of small bowls or ramekins to assemble the cheesecakes. Hope this helps!